Decadal climate prediction aims to improve near-term (10-30 years) climate change projection by using the experiences of weather forecasting and seasonal climate prediction. It has raised a wide concern since the implementation of Coupled Model Intercomparison Project Phase 5 (CMIP5), and the climate community is now trying to turn the decadal prediction from a pure research to a quasi-real-time operational effort. 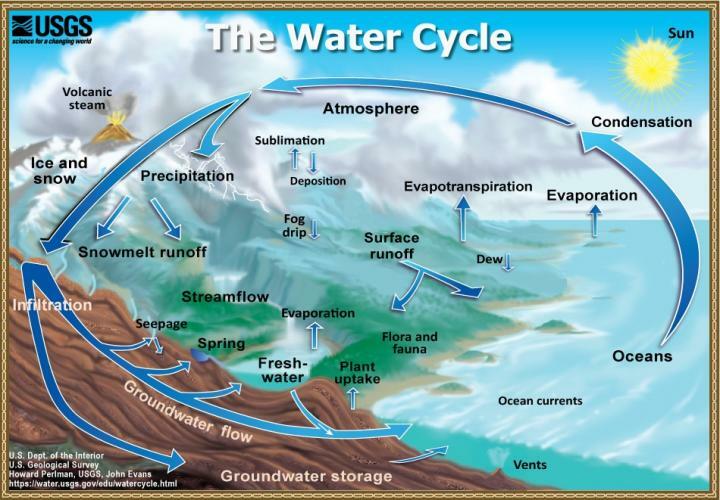 However, very limited information is known about the decadal hydrological predictability over land, which is more relevant to the water resource and infrastructure management. By using a set of global land model ensemble simulations with perfect initial or boundary conditions, Prof. YUAN Xing and his graduate student ZHU Enda from the Institute of Atmospheric Physics at Chinese Academy of Sciences made skillful prediction for terrestrial water storage over 1/3 land areas (excluding Antarctic, Greenland, and desert regions) beyond 2-5 years, especially for semiarid regions where deep soil water and aquifer have a long memory and a non-negligible variability. The hindcast skill can be further enhanced by incorporating low-frequency climate information, including the Pacific Decadal Oscillation and Atlantic Multidecadal Oscillation. "It is now perhaps the time to consider decadal hydrological prediction given tremendous demand from stakeholders for a reliable hydroclimate information over the next few years or even decades, and given promising skill obtained in our study" says YUAN. This study is recently published in Geophysical Research Letters.